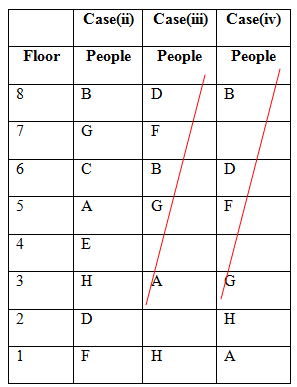 Eight people A, B, C, D, E, F, G and H are living in eight different floors. The lowermost floor numbered one, its above floor numbered two and so on till to most floor numbered 8. All the given information is not necessary to be in the same order. B is not living any floor below E. A lives in odd numbered floor number. Only three people lives between F and A. 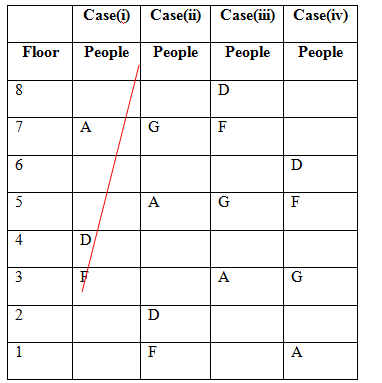 D lives immediately above F. Only one people lives between A and G. G does not live any floor below A. More than three people lives between B and H. Only one person sits between C and E. C neither lives in floor number 4 nor in floor number 2. 1. Who among the following person lives in floor number 5? i). A lives in odd numbered floor number. ii). Only three people lives between F and A.
iii). D lives immediately above F.
iv). Only one people lives between A and G.
v). G does not live any floor below A.
vi). More than three people lives between B and H.
vii). B is not living any floor below E.
viii). Only one person sits between C and E.
ix). C neither lives in floor number 4 nor in floor number 2. 2. How many people lives between H and A? 3. Who among the following person lives in the topmost floor? 4. Four among the five are alike in such a way based on their arrangement, find the one who does not belong to the group? 5. In which of the following floor does G live? 6. How many elements are between ‘15’ and ‘75’ in Step 4? The words are arranged from left end in alphabetical order in each step.
. The sum of the numbers are arranged in ascending order from right end in each step. 7. Which of the following step will be the last step for the given input? 8. What is the position of ‘undermine’ in final step? 9. What is the position of ‘fray’ with respect to ‘87’ in step 3? 10. If the step 3 is: undermine institution fray victory 87 75 valley 15 34 64. Which of the following step will be Input? 1) Who among the following person lives in floor number 5? 2) How many people lives between H and A? 3) Who among the following person lives in the topmost floor? 5) In which of the following floor does G live? 6) How many elements are between ‘15’ and ‘75’ in Step 4? 7) Which of the following step will be the last step for the given input? 8) What is the position of ‘undermine’ in final step? 9) What is the position of ‘fray’ with respect to ‘87’ in step 3? 10) If the step 3 is: undermine institution fray victory 87 75 valley 15 34 64. Which of the following step will be Input? The sum of the numbers are arranged in ascending order from right end in each step.